All versions of AZARDI use the same interface and customization tools. AZARDI Online may have cross platform inconsistencies. Before you use it on a tablet read the known device limitations section below. AZARDI Desktop and AZARDI Online are designed to allow all ePub flow content to be displayed on all platforms, browsers and devices at every viewport size. Standards compliant browsers browsers are essential when using AZARDI Online. With all AZARDI readers the user has control of the presentation experience. There is no interface or "paper" chrome, viewport size restrictions and you can optimize the content presentation for your viewport size and your personal preferences. When an IDPF Spec Fixed Layout ePub is opened the Fixed Layout presentation preference buttons are available. It allows the customization of the background shade and fixed layout chrome. Full screen. Click for full screen in the current display state. Resize Window. The fixed layout book is fluidly optimized for presentation in the desktop application window. The audio icon is unmuted when a page contains SMIL Audio overlays. The following controls can then be used. Personalization Shift+U to hide/show the Personalization options. Font-face selection. Not working in this version. Font size. Click the +/- buttons to change the font size. Margins. Click the +/- buttons to change the margins. Text-alignment. Toggles text alignment between justified and align-left. Hyphenation. Toggles hyphenation on and off. Does not work on all browsers. Page flow. Scroll mode, single page, two column page, three column page, four column page. Column Rules. Toggle column rules on and off. Reset. Resets the interface to a standard two page column view. You can customize the default settings AZARDI uses when opened, and when opening a new book. Height: 700px. Opening interface height set in pixels. Font: Georgia (Windows). Select default font from your OS. Hyphenation: Yes. Options are Yes or No. Justification: Yes. Options are Yes or No. Columns: 2. Options are 1, 2, 3, 4 columns or scrolling text. AZARDI Online works on the following browsers. Note there may be buggy or erratic behaviour occassionally. 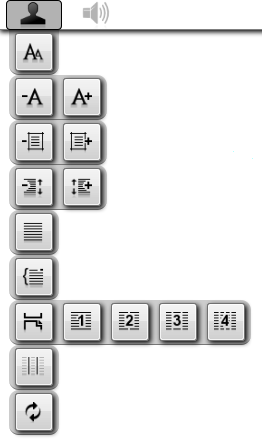 Right-to-Left is laid out correctly but paging is still left to right in this version. Firefox 8+. All functionality works. It will probably work on older versions back to 4. Google Chrome 16+. All functional works. It will probably work on older versions back to 13. Safari 5.1.2+. All functionality works. It will probably work on any 5.1 version. Opera 11+. All functionality works. Column balancing behaves differently to other browsers giving some strange flows in multi-column modes with short pages. Internet Explorer 6, 7, 8, 9. All work identically to Google Chrome if the Google Frame plugin is installed. Without this plugin nothing will work in these versions due to lack of standards support (earlier versions) and lack of CSS-3 feature support. Internet Explorer 10. This has not been tested. No screen navigation touch events are supported yet. configuration events work. iPad Safari. Use scroll mode only. Pagination does not work. paragraph tap audio has not been handled. Android 3- Google Browser. Use scroll mode only. Pagination does not work. Android 4+ Chrome Browser. This is expected to work. Android FENNEC (Firefox) Browser. This is the best. All features work. Change your digital content business instantly. Get your content everywhere... under your control.